Creator: Mrs. Leonidas Hubbard, Jr.
Accompanies: Annual report of the Surveyor General, 1906-1907. To accompany the report of J.W. McLaggan. Map and Data Library copy: Lacks accompanying text. 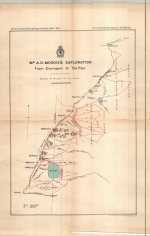 Accompanies: Annual report of the Surveyor General, 1906-1907. To accompany the report of A.D. Moodie. 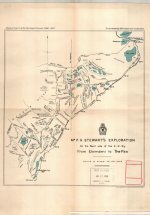 Mr. P. G. Stewart's exploration on the west side of the C. N. Ry. 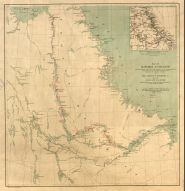 from Etoimami to The Pas along the second meridian, in Saskatchewan. Accompanies: Annual report of the Surveyor General, 1906-1907. To accompany the report of P. G. Stewart. 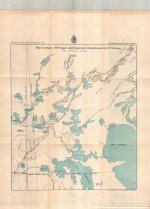 From CD-ROM: "This resource for K-12 teachers and students developed by the Hermon Dunlap Smith Center for the History of Cartography at the Newberry Library is designed to bring historically significant map documents into your classroom. Inside are high quality images of historic map documents that illustrate the geographical dimensions of American history. Each map is accompanied by lesson plans written for four grade levels and designed to support a variety of social studies, history, and geography curricula. Made possible with a grant from the National Endowment for the Humanities, promoting excellence in the humanities. Any views, findings, conclusions, or recommendations expressed in this Web Site do not necessarily reflect those of the National Endowment for the Humanities."